The combination of high quality enamel, 18k gold, and in some cases, brilliant white diamonds, makes the Jean Schlumberger bracelet collection from Tiffany & Company an excellent addition to any wardrobe. The Jean Schlumberger diamond bracelet features a juxtaposition of round brilliant white diamonds and black enamel framed in with 18k gold and platinum. It retails for $130,000 and can only be purchased by contacting Tiffany & Company customer service directly at 800-843-3269. Jean Schlumberger, perhaps best known for his collaboration with famed jeweler Tiffany & Company, has released a series of beautiful bracelets that are available exclusively through the Tiffany retail boutiques throughout the world. Here is a list of our top 10 Jean Schlumberger bracelets, along with the retail price of each. Some are only available by contacting the Tiffany & Company customer service department directly due to the exclusivity and rareness of the design. The Jean Schlumberger Enamel Bracelet with Red Enamel and 18k Gold retails for $27,000. 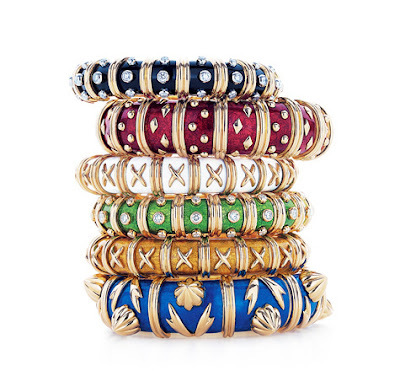 he X pattern Jean Schlumberger enamel bracelet features 18k gold and light blue paillonné enamel. It retails for $22,000. The Dark Blue Enamel Jean Schlumberger Bracelet at Tiffany & Company features 18k gold with diamond and circle patterns on dark blue enamel. It retails for $27,000. At $27,000, this light green enamel Jean Schlumberger bracelet is a significant investment. It features 18k gold and is sold through Tiffany & Company jewelry stores throughout the world. Rich, warm, and magnificent are the words to describe this brilliant yellow Jean Schlumberger enamel bracelet from Tiffany & Company, complete with 18k gold. It retails for $27,000. This Red Enamel, 18k Gold, and Brilliant White Diamond Bracelet from Jean Schlumberger is sold by Tiffany & Company and retails for $40,000. Gold and Light Green Jean Schlumberger Enamel Bracelet with X Pattern in 18k Gold retails for $22,000 at Tiffany & Company jewelry stores. The white and gold Jean Schlumberger Tiffany & Company & Company bracelet retails for $22,000 and features 18k gold on white enamel with a repeating X pattern around the bracelet. Repeating patterns of diamonds and circles in 18k gold against white enamel make this Jean Schlumberger bracelet a unique conversation piece for any woman.